My brother, Jesse, sent me a link about the kind of cat that Velcro was. ohhh that's so sad! I'm so sorry! I even remember that cat!! Sorry to hear about your beloved pet Kelly.It is certainly much harder when they have been part of the family for so long.. Thought it was strange that you had not been around to cube's for your weekly "pkak" Nanc! Hey all, thanks so much for the condolences. I was at my mom's house holding that cat when she told me that she was taking it to the animal shelter that day. I pulled out my camera and snapped a picture of Velcro. That was the last picture taken of Velcro. What a loving tribute to your cat. You were lucky to have Velcro for so long & he was lucky to have humans like your family. BTW came here via nanc. ODL! i sure hope i don't have to start coming here for a BI-WEEKLY pkak attack! Sad story, but wonderful that your family had such a loving pet. 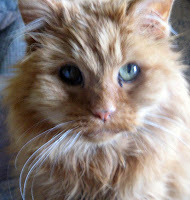 I've got a cat named Hobbes who is 15 in August and he's just the best pet. Ohhhhh Kelly, that is the saddest thing to hear. I know it must have been a difficult decision for your parents; but like you said, it was the humane thing to do. I'm sure he is in pet heaven now, and playing with all the other cats who went before him. He will stay alive and in your heart every time you remember and tell a story about him. Pets are such a personal thing that they can become full-fledged family members. Velcro was a big part of my life as well. In fact, my kids and the other grandkids' first exposure to the word "velcro" was Grandma's cat. When they were introduced to shoes with velcro closures, they referred to them as "kitty" shoes. Before I was married, I would sit on a chair in my bedroom, and Velcro would jump from my bed to my back, sinking his claws into my back. Although it was very painful, I couldn't get mad at him because after attaching himself to my back, he would sit on my shoulders and "knead" my hair as if he were nursing from his mother, purring the whole time. I could tell that he loved me. I loved Velcro also, and I miss him. He was a much-loved member of the family.